In order to better understand the function of a roller rack, you must first understand the function of a pallet rack as they can differ from application to application. For starters, pallet racks are simple a way to house or store pallets when they are not in immediate use. Roller Racks – Ridg-U-Rak, Inc.
A lot of times products will be put onto pallets and stored, but because pallet racks are open on all sides the product is readily available when needed. Because pallet racks are so versatile in the industries they serve, the overall style of pallet racks has changed and adapted to each application and how workers utilize them. This is where the roller rack comes into play. As a style of pallet rack, a roller rack is part of what is known as flow and push-back designs of pallet racks. 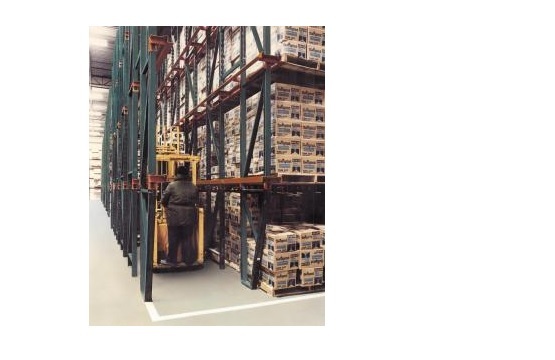 Typically, a roller rack is utilized in order to increase storage capacity as it allows for the pallets to be easily moved along the pallet rack through the use of rollers. These rollers allow the pallet to glide along with minimal force whereas typical pallet rack solution would require the use of a forklift or similar equipment. This style of pallet rack is great when a lot of movement happens on a constant basis as it allows for this movement to take place as effortlessly as possible while still providing a safe and stable storage area for your pallets. These high-density pallet systems are often styled with a slanted rail of rollers to utilize gravity as much as possible in order to assist in moving heavy pallets along. Reach out to a couple roller rack manufacturers to see if this style of pallet rack is right for you, and if your unique application does qualify be sure to detail your needs a requirements to ensure that you receive a final product that will provide value to your operation. If you do not utilize constant movement of your pallets then a roller rack may not be the right choice for you but the right manufacturer will undoubtedly point you in the right direction. Roller Rack Pallet racks are a very common thing in the manufacturing world, roller racks are a style of pallet rack.